Another great Brexit thing (making 2): this ad for Marmite came out on the day we were originally meant to be leaving the EU. Although of course in the end we just had another vote and then went back to wondering what might happen next. I was stood on a tube heading through central London this morning reading about Brexit. As we trundled through the various stations, it struck me that this group of people could care less about leaving Europe, staying in Europe, or any of the debate going on a few miles away. The whole thing is a figment of the imagination of the over-privledged political class. I don’t believe any of my fellow passengers would have thought about Brexit for more than a few minutes in their whole lives if the fake debate hadn’t be cooked up by a bunch of self-interested public school wankers. The Torries were divided on it in their usual Eton vs Eton debating society way. So they picked a fight to see who would win the cup this year, and dragged everyone else in to it. The primary argument in the debate was that another political elite – the European politicians – are a bunch of tossers setting silly rules about the shape of bananas and so on, Jean Claude Junker is a bit of a tipsy rude old man and the other one is snarky (although there’s nothing wrong with that). One group of out of touch politicians, criticising another bunch of out of touch politicians, for being out of touch. So one group of tossers won the debate but it turned out to be less easy to do anything about it, and so they moved on to the next toff-scrap about who would get to hold the conch or whatever it is they do at Eton. To watch the glee with which Johnson and Mogg beamed when they heard the news of May’s demise, there could be no doubting what the real game for these overgrown schoolboys could be. And yet, on my tube as we went through London, was people of every size, shape, dialect, and presumably bedroom habit. And a bit like Marmite, whether we like or loath the EU, most British people, I think, actually have a lot in common – at the heart of it a view that there is fundamental decency is what we stand for. A kind of pragmatic fairness (such a queuing, putting up with bad weather) is how we do things. And actually it doesn’t matter if people like yeasty spreads or not, or whether they hate or love Paris, Rome, Berlin, Brussels. When provoked, we may have become divided over whether we liked the politicians in Brussels. Now we are united by our lack of respect for politicians of all locations. I’m not trying to whip up anger, but did anyone other than Gove and Johnson and Farage and Mogg get us into this? And now we see that what most of them really wanted was to be promoted to Prime minister to get us out of it. Surely that’s too much? Let’s not let this silly public school game divide us. We’re bigger than that. Whatever happens, don’t forget Brexit politics today has become a lark for a group that could care less about the UK and it’s people. They lack the decency that we all share. It is they that should be forced to leave, and we should all be united in voting them out, whether we Brexit or not. 1/ That customers want to have a relationship with their brands. There may be some very special brands that are like that for some very ‘special’ people. Obviously, there are the Mac people. I’m told some people are very keen on sports clubs, but does anyone really want to have a relationship with their breakfast cereal? 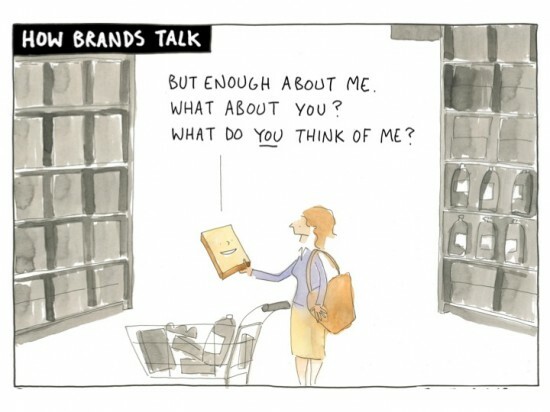 2/ That consumers spend very much time at all thinking about what brands mean to them. Of course the wonks at branding agencies would love to perpetrate this myth (and indeed the one above). We’ll get people to “Like us on Facebook”, they plan with the most wonderful double think: “When I friend a brand on Facebook, I’m just messing around. When a ‘consumer’ does it, they’re really serious”. Yes, you might be able to trick a customer into clicking on a Like button about your brand, but don’t be convinced that they care, or even remember you. And ask yourself further if the patronizing empty content on most brands’ Facebook pages is likely to have a positive effect on any poor sods who find themselves there accidentally.